Analytics is increasingly an integral part of day-to-day operations at today's leading businesses, and transformation is also occurring through huge growth in mobile and digital channels. Enterprise organizations are attempting to leverage analytics in new ways and transition existing analytics capabilities to respond with more flexibility while making the most efficient use of highly valuable data science skills. The recent growth and adoption of Apache Spark as an analytics framework and platform is very timely and helps meet these challenging demands. The Apache Spark environment on IBM z/OS® and Linux on IBM z Systems™ platforms allows this analytics framework to run on the same enterprise platform as the originating sources of data and transactions that feed it. If most of the data that will be used for Apache Spark analytics, or the most sensitive or quickly changing data is originating on z/OS, then an Apache Spark z/OS based environment will be the optimal choice for performance, security, and governance. 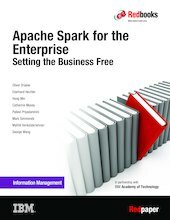 This IBM® Redpaper™ publication explores the enterprise analytics market, use of Apache Spark on IBM z Systems™ platforms, integration between Apache Spark and other enterprise data sources, and case studies and examples of what can be achieved with Apache Spark in enterprise environments. It is of interest to data scientists, data engineers, enterprise architects, or anybody looking to better understand how to combine an analytics framework and platform on enterprise systems.